The biggest reason my husband started driving was because of his family. My husband always wanted to give his family the best. He felt that driving would give him the chance to get our bills paid off a sooner. He also loves to drive; he loves to be on the open road. For those that have someone in their life that is thinking about becoming a truck driver I will have to tell you that it's not going to be easy - especially during the first year. There's a lot involved and there are going to be some challenges along the way. With that being said, you have to look at the big picture. As long as a solid family base is there to support the driver, truck driving can be a very fulfilling career. One thing is for sure, truck driving is not a job you can take lightly. There has to be passion behind it along with patience and understanding. My husband was looking into truck driving jobs in his spare time and when I had the extra time I would help him look. You could definitely say making this decision is something we went at together. We looked at many different trucking companies so we could see what each had to offer and compared them. Some companies we looked into were PAM Transport, USA Truck, and Old Dominion. Believe it or not, money was not the biggest factor in looking into these companies! Don’t get me wrong, we did look at what each company paid and we did take that into consideration. But I think it's important to remember that you cannot just look at money when looking into any job - especially trucking. Some other things we looked at were the benefits that each company offered such as health insurance (we needed a policy that offered a major medical), life insurance, and a 401K plan. Home time was also another important factor in making our decision. We knew from the start that this was going to be hard because we have never really been apart. Then we found Driver Solutions and we did our research on the company. We both decided that there was no way we could pass on this opportunity. My husband had a personal representative that worked with him on getting his applications filled out. Driver Solutions was very helpful in helping my husband get more information on PAM Transport. We found that PAM Transport would pay for my husband schooling as long as he stayed with them for a year. This is not something that you will find with many companies. PAM was willing to take someone that they did not know and pay for them to get there CDL’s and then give them a job. This was a very important factor because getting a CDL can be very expensive. 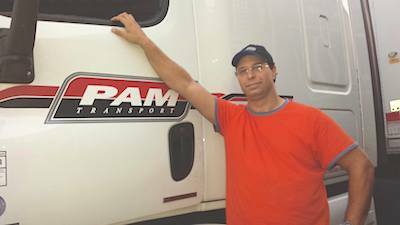 Our family did not have the extra money to spend and that made the company paid CDL training program our best option. This was a very hard decision for us to make because we knew that this meant he was going to be away from his family. At the same time, we knew that in the long run it would be the best thing for our family moving forward. We weighed the pros and the cons of each company and we weighed the pros and cons of him taking on a new job. We took the time to talk to our oldest two children about what my husband/their daddy was going to do and why it was important for the family. We felt that telling them ahead of time would be best so they would have time to ask questions. My stepfather is also a truck driver and we talked to him a lot and asked as many questions that we could. He was very honest with us and he told us that there were going to be things that we did not like and at times things were going to be hard. He did tell us that if my husband stuck with it then it would pay off in the end. All our friends and family were very supportive of my husband. I feel that my husband and I have a great support system and that makes all the difference!